To steam line high-volume machining processes through the integration of transfer lines controlled using state-of-the-art FANUC CNCs. By introducing a transfer line into a single machining centre, production times are significantly reduced. The workpiece is loaded into a clamping device which is fixed to a transfer line. It is then moved with impressive speed and accuracy between up to 4 multi-spindle tool heads. Working in parallel with the machining process, downtimes caused by tool changes are a thing of the past. This complex process demands leading-edge CNC technology, so FANUC’s 31i series was the obvious choice for the job. Anger Machining’s pioneering machining systems that significantly improve productivity over a extensive range of industries. ANGER MACHINING has made a name for itself as a pioneer of series technology for CNC-controlled series machining systems. These so-called transfer centres, considered a combination of a machining centre and a transfer line, are impressive due to their high-output, yet flexible, series production. Examples include two HCXchange 2000 machines, controlled by a FANUC Series 31i CNC, delivered to the automotive supplier Magna. ANGER MACHINING GmbH, based in Traun, Austria, is a manufacturer of high-speed machining systems. With its series concept developed in 1984, the company has set new productivity standards and gained a successful standing in the world market. Roland Haas (Dipl.-Ing. ), Head Engineer at ANGER, explains in a nutshell what makes this technology special: "We have implemented the concept of a transfer line in a single machine." The work piece is loaded in a clamping device and then moved lightning fast from one stationary spindle to the next. The chip-to-chip times are extremely short, ideally only 0.3 seconds. The work pieces to be machined can be moved linearly and rotationally in all spatial axes and thus machined from six sides. All the tools are picked up by special machining spindles and multi-spindle heads mounted on up to four sides of the machining area of the centre. On these high-production machines, down times caused by tool changes are a thing of the past. On the flexible ANGER machines, tool changes are carried out in parallel during the machining time. This results in shorter cycle times and high output on a much smaller footprint – compared to traditional machining centres. In roughly 20 to 40 stations, the machine handles all required machining tasks – and does so with utmost precision, he tool remains in the exact same position in the tool holder. As clamping only has to be performed once, this reduces clamping and manual positioning errors. As a result, ANGER transfer centres can achieve process reliable position tolerances of 0.015mm, with diameter tolerances of IT 5 and roundness values of up to 0.001mm. The small weights moved help reduce wear and tear on system components and enable extremely dynamic traversing characteristics with machining speeds of up to 90 m/min and 1 g acceleration. The highest level of rigidity is provided by the machine beds fortified with vibration-reducing steel-reinforced concrete, which depending upon the machine specifications can weigh up to 25 metric tonnes. ANGER transfer centres are the ideal choice especially where unit numbers from 150,000 to 500,000 per annum of the same work piece or with a similar design are required. In the company's early history, ANGER delivered its high-performance machines primarily to the eyewear industry. They were able to reduce down times thanks to machining with several tools, and thus offered an efficient method for fully-automatic milling of eyewear frames from plastic blocks. After machining in this market was displaced by ever-increasing quality of injection mould technology, ANGER delivered its machines to the growing market of mobile telephones, where, for example, they milled magnesium frames for Ericsson cell phones. The focus then very quickly shifted from the cell phone industry in the direction of the automobile industry, where similar unit quantities of the same work pieces were required. In the beginning, these included above all shafts and cube-shaped components made of aluminium. In the meantime, with the introduction of the machine models ANGER HCS and HCP, the range of applications was expanded to ABS cylinders and many other small, complex components. The ANGER machines also continued to evolve. Out of the HCP series grew the HCX model, which indeed retained the proven basic principle with stationary spindles and a moving work piece, but the technology was completely reengineered. The most obvious innovation is the flange frame on which the machining spindle units are freely mounted and can be easily rearranged. Roland Haas reports: "For the HCX, we carried out a complete mechatronic development and used the full spectrum of virtual simulation." First of all, the developers calculated and compared the various travelling columns with box-in-box group mounts, whereby they opted for the latter solution. With various partners, they developed the concept further. Supported by a mechatronic simulation system, they optimised the various components in several development iterations. Roland Haas explains in more detail: "We improved the rigidity in decisive areas, whilst reducing material where mass is moved. And we simulated and optimised the control behaviour of all the axes. Only after all simulations were set up in green was the HCX prototype built." For the series, ANGER finally optimised its new machines with respect to service life, as well as ease of assembly and maintenance-friendliness. In addition, the machine engineer introduced a CAM system with which immediately after receiving an order, the subsequent machining process can be simulated. "This enables us to design the spindles in a way that is guaranteed collision-free", explains Roland Haas. After all, ANGER works as a general contractor. This means it not only delivers the machine but also the entire machining process with a pre-determined cycle time. The project is handed over to the customer turnkey ready with the CNC program, statistical quality certificate and automation. In 2014, the next milestone in the company's history was established with the market launch of the ANGER FLXBL. These machines are flexible, standardised, modular transfer centres, designed for the machining of precision parts in medium-to-large volume production. The ANGER FLXBL can be easily and quickly reconfigured, and a great variety of work pieces of various volumes thus can be machined in several sequential product life cycles. Thanks to its flexibility, for the system operator this means the greatest possible protection of his investment, coupled with the advantages of the proven transfer centre technology. "For the application of the CNC systems on the HCXchange machines, FANUC control specialists visited us, offering us true first-level support." Two ANGER HCXchange 2000 machines (basically also the precursors of the ANGER FLXBL) were delivered in 2011 to one of the world's largest automobile suppliers, the Austrian-Canadian Magna Group, which has its European headquarters in Oberwaltersdorf, only 2 1/2 hours from Traun. In the production facility at the Lannach location in Austria's Styria region, balance shaft housings for petrol engines are machined on both Anger machines, 300,000 units per annum. Each machine can produce the complete finished part in one set-up. A central automation cell with the robot between both machines supplies them with blanks and lays the finished machined parts onto a conveyor belt. This solution on the smallest footprint and with the lowest costs per unit represents the most economical machining solution for Magna Powertrain Lannach. The requirement of flexibly retooling the machine for another component is also fulfilled. The work pieces require complex machining and call for very high specifications for precision with respect to bore holes for bearing points, right down to flange images, flatness values and reference points. The 35 machining steps are carried out on an HCXchange with a cycle time of 114.25 seconds per part, including fully-automatic loading. Through the use of multi-head tools, the quantity of individual elements in terms of bore holes and threads is even higher. Magna ordered both ANGER HCXchange machines with control and drive technology from FANUC – it was not a new partnership for ANGER, as primarily components of the CNC world market leader were deployed there up to approx. 5 years ago. Roland Haas explains: "At that time, we were doing lots of work for the North American market, which mainly required FANUC controls. The cooperation with FANUC was very good for us. The overheads in the area of service and maintenance were minimal, and the products were absolutely reliable. Unfortunately, the recession in North America and in the automobile industry there caused the cooperation with FANUC to dwindle. So we at ANGER were very pleased about the order from the Magna Group to equip the ANGER HCXchange machines with FANUC. Because now we will have this reliable, strong partner back on board." 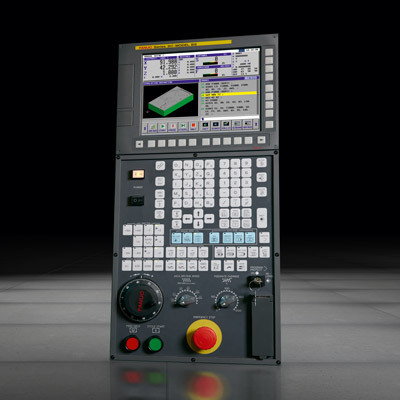 In addition to the implementation of the FANUC Series 31i CNC system, major attention was initially focused on the drive system of the machines configured according to the box-and box-system. A special feature, for example, is traversing in a horizontal direction, which is achieved via two ball screws in parallel operation. The object here was to choose the proper settings, and ensure reliable control adjustment. Finally, positioning accuracy in the µm range is required. 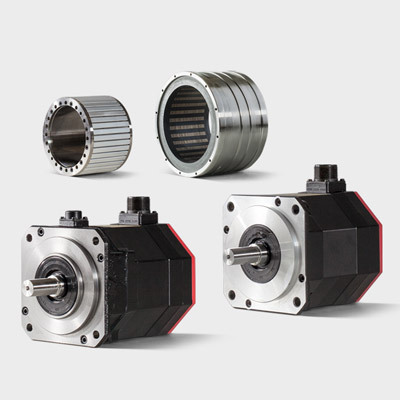 Another challenge were the third-party motors to be integrated. Because ANGER implements proprietary hollow shaft servo motors in its machine concept. Another issue was that four axes are used as standard on the ANGER HCX machines. A fifth axis is implemented in the clamping device upon customer request. Roland Haas reports: "For the Magna order, we had to deploy a dual torque drive for the first time. But this drive adjustment and optimisation was also something we were able to handle together with FANUC." In order to solve all the drive and control issues, specialist knowledge was required, which FANUC provided from its German subsidiary, along with additional support from Japan. Roland Haas is satisfied: "The same FANUC control specialists visited us who were already very familiar with the product from before. They offered us genuine first-level support." On the control side, the specifications for one-off or special cycles are limited. Instead, ANGER ensures that wherever possible, all machining operations and traversing movements can be programmed with simple commands and standard functions, in order to achieve rapid cycles. That is why the look-ahead function of the control and a very rapid PLC cycle time are among the decisive factors for ANGER in the battle for tenths of a second. There were also very demanding requirements for the PLC programming, mainly due to the two double tool changers per machine. FANUC assumed these programming tasks. According to Roland Haas, it was very important for ANGER to be able to source this special knowledge as a service directly from FANUC. In his view, series manufacturers benefit the most from the reliability of FANUC drive and control technology. He added that once everything was implemented and tested, it continued to function for a long time. In case the replacement of components ever became necessary, this would be handled in a very practical manner. Also with respect to user-friendliness, ANGER can count on FANUC. The machine manufacture made a major investment in an HMI (human machine interface) that is as convenient as possible, offering the user a variety of visualisations. Integrated photos, for example, indicate exactly where faults have occurred and how they are to be remedied. Admittedly, customer-specific interfaces such as these had not been a major strength of FANUC controls in the past, but all that has changed now. Roland Haas confirms: "In the meantime, FANUC provides visualisation options that are of great benefit to us and, above all, to the machine operators." ANGER provided the specification as to how the screens were to look. The implementation of the screens was in turn a service provided by FANUC. The international machine engineering company with headquarters in Traun, Austria, has specialised in the development and production of transfer centres. These high-speed machining systems are used above all in the automobile industry for the machining of series parts with particularly high precision specifications. The main focus includes applications for engine, gearbox and chassis parts made of aluminium or steel. With three subsidiaries in Germany, the United States and Japan, along with numerous sales and service partners, since its establishment in 1982, the company has established a successful standing in the world market. Among other applications, ANGER transfer centres are used for machining valve bodies for automatic and dual-clutch transmission systems, automobile transmission housings, bedplates, balance shaft and cam shaft housings and other prism-shaped precision components or engine and gear shafts. Its customers include international automotive manufacturers such as Daimler and VW, as well as leading automotive industry suppliers such as ZF, Magna, Mahle, ThyssenKruppPresta, INA Schaeffler, Bosch, or Linamar Group, along with numerous die-casting companies.